Deep Thoughts from an Author's Cave: Authors' Cave Halloween Blog Train! Oct. 30-31! Authors' Cave will host its quarterly blog train on October 30-31! The theme will relate to Halloween. 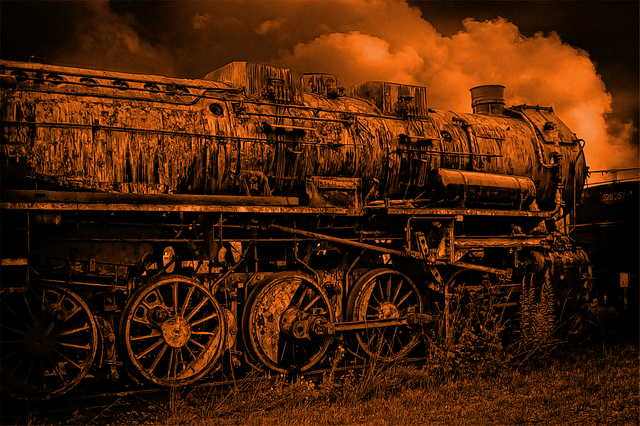 Halloween Blog Train format - Each train car (blogger) should include this spooky train image and answer these questions. You don't have to answer them all if you really don't like one, but try. Participation in the Story Train at the end is required. 2. What is your favorite scary movie? You can include a video clip if you like of your favorite part from that movie...like this. 3. What scene from a book or movie scared you more than any other? 4. If all of Stephen King's bad guys were after each other, who would win and why? 5. Give a Treat! Provide a link to a Halloween treat or beverage recipe. A photo is nice too, if you want. 6. Provide the cover, link and 2 or 3 sentence elevator pitch for the book or series (of your own) you would like to feature in your blog car. We will give each member who participates in the blog train a specific order for their car in the train. Car #1 will start with one of the three story beginnings below. Car #2 will start the story where car #1 left off. Each car will follow in the same manner. Each car should only feature two or three paragraphs of the story. The idea is to try to get people to follow the entire train to read all of the story. Each car will have a link just above the story that should say, 'If you are just beginning the story, please click this link to go to the beginning at Car #1.' Each story will be followed with a link that says, 'To continue the story, click here' and that will take the reader to the next car. We will cut off the sign up for the Halloween Train on Oct. 25 and will let the person know at that time that will be the last car and create the ending. You guys will get to vote for which of the following story beginnings we will start the train with. I open my eyes and nothing changes. It's pitch black. I go to sit up and hit my head on something above me. What? Where the...I put my hands up and they are stopped only inches from my face. Something is closing me in. I swallow hard. Think. Think. What is the last thing I can remember? for more details and to sign up to host a car or purchase a ticket to ride!